Home » News » J-POP GO – Tonight! A reminder that J-POP GO returns to London tonight as we bring an evening of J-Pop Goodness to the Vibe Bar, Shoreditch! 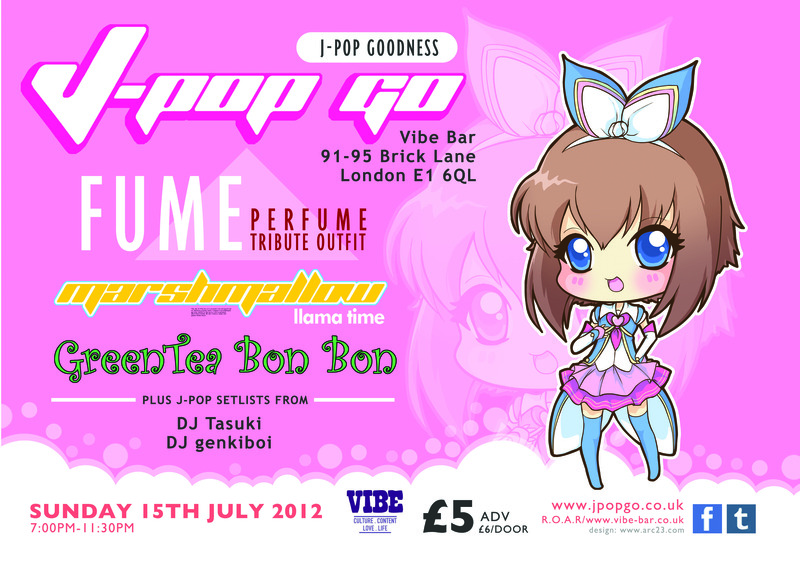 The UK’s longest-running J-Pop club night will be bringing you a variety of J-Pop, K-Pop, Idol, Anime and Game tunes. The event will feature DJ sets from DJ Tasuki and DJ genkiboi playing tunes from the likes of Perfume, Kyary Pamyu Pamyu, 2NE1, Hatsune Miku, AKB48, Morning Musume, capsule, Arashi, L’Arc~en~Ciel, Tommy February6, Kanon Wakeshima and more! J-POP GO will also feature performances from FUME (the Perfume tribute outfit), the debut of the J-Pop-inspired Marshmallow Llama Time (featuring Finny Attridge) and dance performances from GreenTea Bon Bon! Entry is just £6 and the event kicks off at 7:30pm.